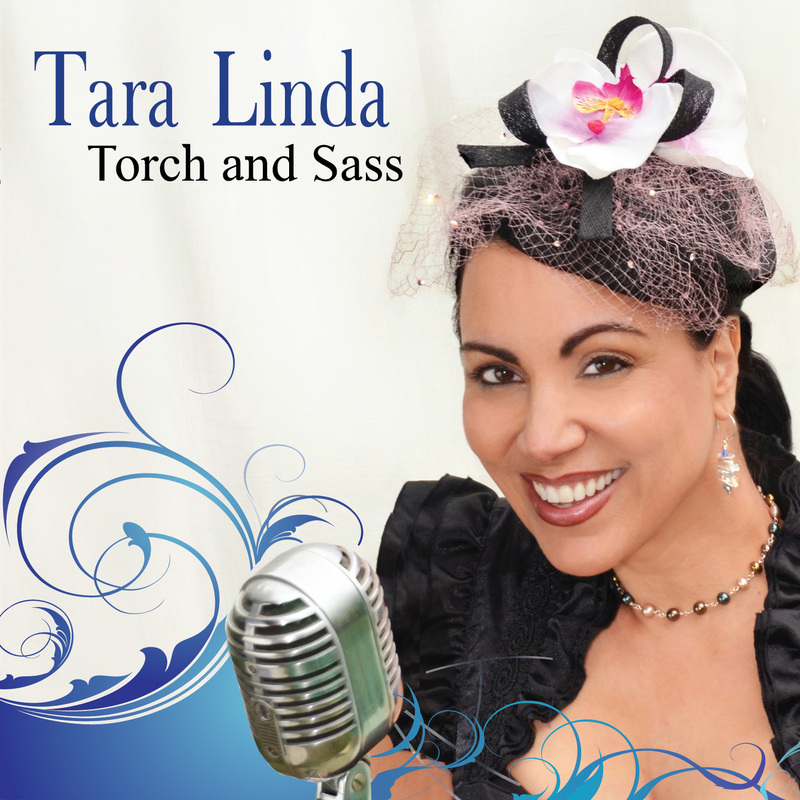 Torch songstress Tara Linda sings original jazzy blues and Latin torch. From smoky ballads to sassy swings, her delivery is sultry and playful. Celebrated for her voice, Tara Linda's performances are described as "mesmerizing" (TimeOut Oakland Tribune/San Jose Mercury News). While her vocal style hints of 1930’s/40’s torch tradition, her catchy hooks, humor and contemporary themes make Tara’s music stand apart. Inspired both by both American and Latin American torch singers—from to Sarah Vaughan to Lydia Mendoza, Tara was steeped in the jazz, blues, and Latin traditions of her Texas childhood. “Coming of age in Austin, I listened to everything I could find- jazz, blues, punk, and Tex-Mex.” Tara began singing from behind a drum kit, playing in Texas and American roots genres. Her third album, Tortilla Western Serenade, received critical review, charted in the top 20 on the national RMR, FAR, and Euro-Americana radio airplay charts, and was named “FAR and Away’s Best Debut albums” of 2010 (Freeform American Roots Chart, Austin TX). “As a songwriter and performer, I’ve always loved the traditional early jazz song forms.” To inspire her latest songwriting, Tara’s turntable spun constantly with Louis Armstrong, Count Basie, Sarah Vaughan, Augustin Lara, and Irving Berlin. “I was inspired by the way lyrics told stories, and by how prominent melodies were in the vocal jazz of the 30’s and 40’s. Hooks were well-placed with lyric lines. And lyrics were funny! There seemed more irony and tongue and cheek humor then.” With these vintage jazz sensibilities in mind, Tara set out to write her first stomp ("Recession Stomp"), swing ("Rumor Mill Swing"), and jazz ballads for her fourth CD, Torch and Sass (May, 2012). Vocally, Tara set out to explore Torch as a genre, as well. Everyone knows the old torch lament sung by a distraught woman, who stays up drinking coffee all night waiting for her man to come home. But for Tara, torch sensibilities fit well into current themes; feeling helpless about things we can’t affect- like earthquakes and tsunamis”- ("Flux and Flow" was written following the 2011 Japanese tsunami); or sudden remorse ("Little Miss Remiss") tells of a girl who realizes how hurtful her unthinking actions can be).” But Tara Linda’s Torch and Sass doesn’t only salute the past; she also adds contemporary jazz shuffles, tangos, and even an Indian jazz tigress tune to the mix. Living in Oakland, Tara Linda performs with Bay Area band The Rumor Mill. In Texas she teams up jazz saxophonist Charles Hearn (Celia Cruz, Ray Charles, Tito Puente), and members of his quintet- all of whom helped record Torch and Sass. Tara Linda’s Bay Area band The Rumor Mill Includes: David Ehme (guitar), Fred Paclibon (bass), Rafael Hererra (drums), Gil Cohen (trumpet, flugelhorn), John Kadyk (clarinet, tenor sax). 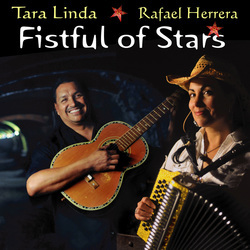 Tara Linda is endorsed by Hohner Accordions and Lanikai Ukuleles. All music, lyrics and arrangements by Tara Linda © 2012 Tara Linda Physalia Records (BMI) except #1 music by Tara Linda & Jose Alvarez (Mexifi Music BMI), #5 music by Tara Linda and Paul Eastburn (ASCAP), and #10 horn arrangements by Charles Hearn. Zeke Aguilar – piano (2-5, 7, 10, 12); alto sax (5, 11); back up vocals (6). Jose Alvarez – guitar (1). Paul Eastburn – bass (5, 10-12). Ron Guensche – bass (1). Ron Harrington – bass (2-4, 7, 9) . Charles Hearn – soprano sax (2, 3, 5, 6, 11, 12); tenor (3, 10); back up vocals (6). Mixed by Charlie Barrego. Gospa Records (McAllen, TX). Mastered by Billy Stull. Masterpiece Mastering (South Padre Island, TX). Gospa Records (McAllen, TX), Engineer- Charlie Barrego: Songs # 2-5, 7, 9-13. New Vintage Studios (Oakland, CA), Engineer- Ron Guensch: Songs #1, 5, 6, 8, 10-12. Wally Sound (Oakland, CA), Song #8. Rafael Herrera – drums (1, 6, 8). Rudy Ruffelsen – drums (2-5, 7, 9, 10, 12). Az Samad – acoustic guitar (2-4, 6-9, 13); electric guitar (8). Jesse Sheehan – tablas (11). Steven Strauss – soprano ukulele (6); bass (6). 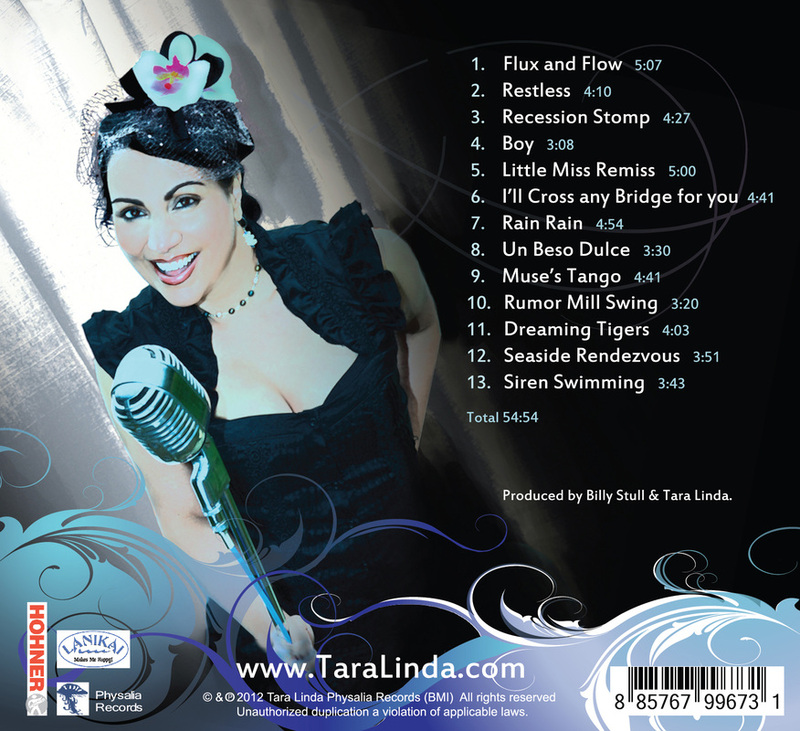 Tara Linda – voice (all); accordion (9); baritone ukulele (2,13); bass (8).